I agree 100 % with this article. Government needs to repeal the Commodity Futures Modernization Act of 2000 which allows for speculators that drive up the price of oil. Oil changes hands so many times on paper/electronic trading before it reaches the refinery that it is ridiculous and it is all to make a buck at the expense of the consumer. People need to write their representatives, not emails, about this unless you like paying $4 a gallon of gasoline and high heating costs. Drill Now? Try Regulate Now. Printed in The Wall Street Journal, page A13 Write to thomas@wsj.com. By the standards of Washington, President Obama’s decision last week to open new areas off the nation’s coasts to oil drilling was something of a master stroke. With one deft move he both swiped a strong Republican issue from 2008 and defied environmentalists, an element of his coalition that is roundly despised on the right. The president also extended a hand to the people he trounced in the health-care debate, setting the stage for possible acts of bipartisanship in the future. For a city that regards this kind of calculated “pivot” as the noblest form of statesmanship, the announcement was almost Clintonesque in its brilliance. Triangulation is back and the cherry trees are a-bloom as though in celebration. The actual results of the offshore drilling itself are secondary considerations, if they come up at all. Essentially, we are going to allow drilling off the coast because “drill here, drill now” was a slogan that polled well during the last presidential campaign—which unfolded, you will recall, as gasoline prices were hitting $4 a gallon. Now, I don’t know whether offshore drilling will be an environmental catastrophe; maybe if it’s done carefully everything will be fine. And while ending our dependence on OPEC would be a marvelous thing, I have no idea whether offshore drilling will do much in that regard. But I have my doubts. “Drill here, drill now” was itself a purely political gesture, not a real solution to the problem. It was a way of pinning blame for the insane price of gasoline on liberals, who, according to legend, hold squishy pink ocean creatures in higher esteem than American consumers. Those who popularized the phrase were not asking us so much to resolve the energy question as to spit a little hate at an ugly stereotype. But if what the president wants to do is to make sure that another oil shock of the 2008 variety doesn’t happen again, this is not the way. After all, oil didn’t zoom to $147 per barrel in ’08 and then plummet to $35 the next year because OPEC declared an embargo and then suddenly lifted it. Nor did it happen because Chinese motorists decided en masse to junk their cars. We may never know for sure the combination of circumstances that brought on the energy crisis of that year. But one factor was almost certainly the Commodity Futures Modernization Act of 2000, which allowed unprecedented levels of speculation in oil futures by investment banks and pension funds, bringing the familiar boom-bust cycle home to the gas pump. To understand this we need only turn to the business section of the Washington Post on the very day that Mr. Obama’s new offshore drilling policy was announced. There, reporter David Cho described the history of the deregulatory measures, their probable effect on the zany oil-price swings of recent years, and the low-profile battle that is currently under way at the Commodity Futures Trading Commission (CFTC) to re-regulate energy markets. If the Obama administration succeeds in bringing oil prices under control, this is where they will do it. 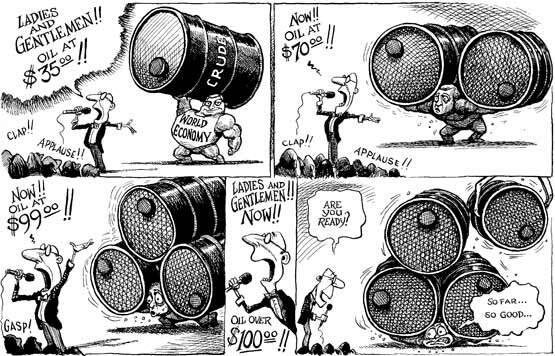 The essential similarities between the oil fiasco and the larger financial crisis are striking. Both episodes showed us the same cast of characters—Goldman Sachs, AIG and the rest—taking advantage of deregulation. And the whole rotten thing was then defended by the same bunch of free-market wise men, who brushed off doubts with a condescending laugh and a snort of indignation. How little critics know about the fantastic complexities of markets. And how arrogant they are as they threaten our freedom to speculate. And how long are the rest of us supposed to sit passively as we watch gas prices zoom up again? Countries have fought wars for oil, but what is required of us is that we dump the shibboleths of the last 30 years. We should drill if we must, but the best slogan would be: Regulate here, regulate now! SUNLAND PARK, N.M. (AP) — An armed group that has been patrolling the U.S.-Mexico border left its post in the New Mexico desert Tuesday amid pressure from law enforcement following videos that showed militia members stopping migrants who had illegally crossed into the country.